Part 2 of Tamparuli day trip. Part 1 HERE. 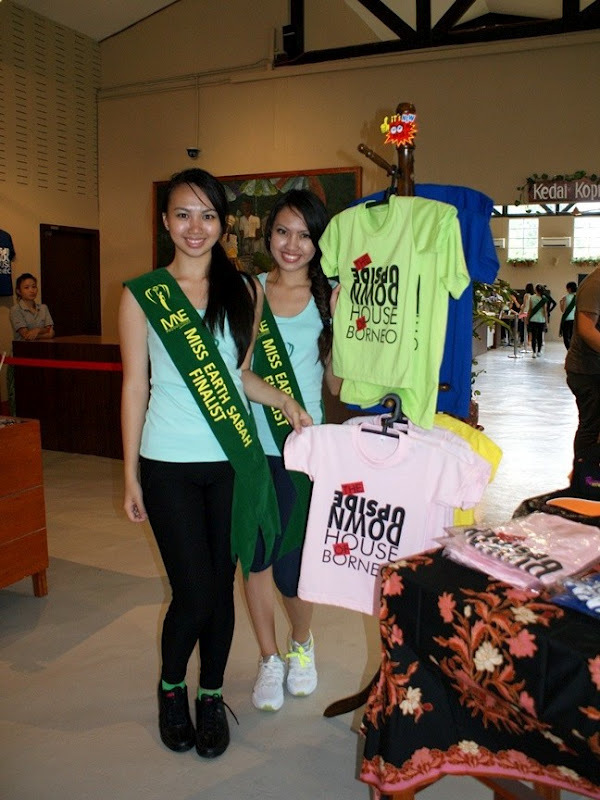 Now, being Miss Earth Sabah finalists, these beauties handled whatever Mother Earth threw at them, with a smile! Traipsing up the walkway after hitting the gong 3 times - Sabahan style! Everything, and I mean everything, inside is upside down, which means the furniture is bolted to the ceiling, while the fans, lights, and even the lizards are on the floor. The only thing that is not upside down is a Chinese ornament which is used to bring luck. Obviously, if you hang that upside down, it will also bring the opposite - bad luck! 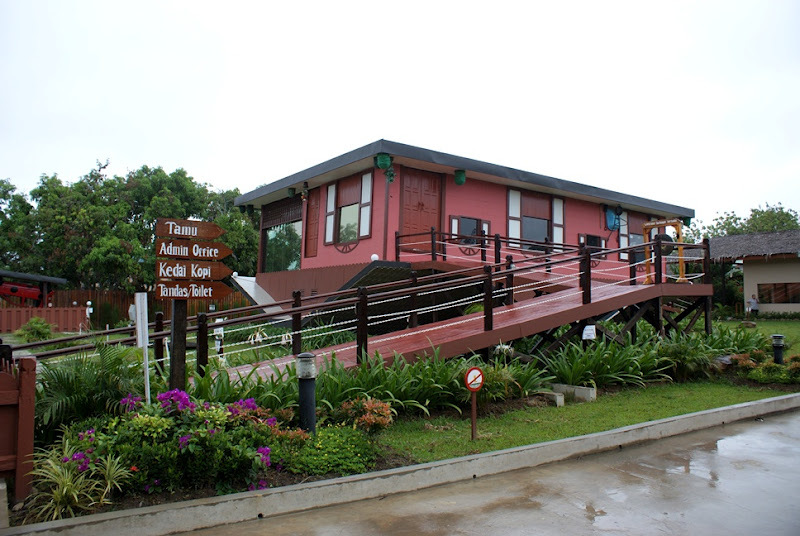 The house is built as a traditional Sabahan house, with the design more specifically coming from Kota Belud. with the living room, kitchen, and all the bedrooms decorated as such. Even the jamban a.k.a. toilet is the traditional squat toilet! There are slippers on the 'floor', and even playing cards and coins strewn around, again, on the 'floor'! A pet cat sits on the upside down sofa, and they even have a handwritten height chart written upside down on the wall! 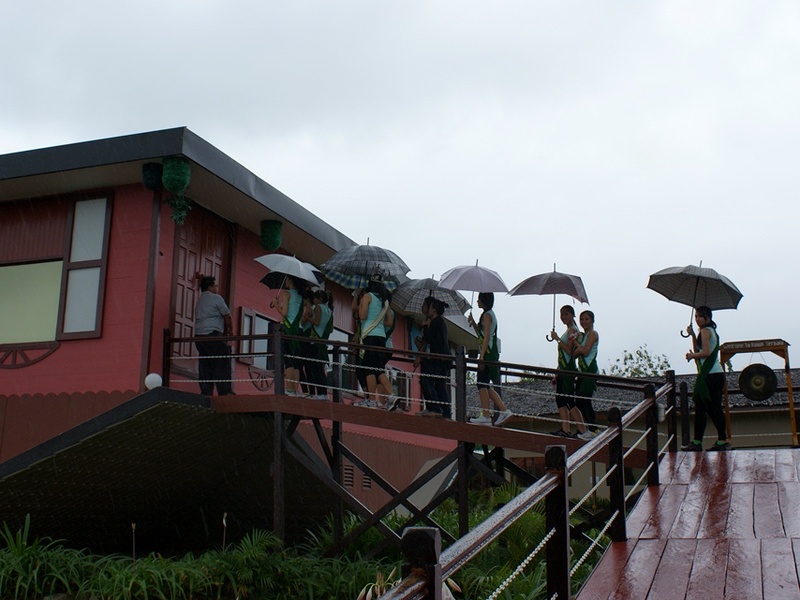 The owner, Mr Alexander Yee, was there to greet us, and he told us that the house is actually the first upside down house in South-east Asia! Whee..!! Yet another reason everyone should come and visit Sabah! =D We do have a variety huh? ;p After visiting the house, visitors can go to the souvenir shop, called the Tamu (which means 'market' in Malay) to get unique and environmentally friendly gifts. After lunch, it was time to make our way to our 3rd and final location for the day (during which journey I had a very nice nap in the van.. ;p), so we bid goodbye to the staff and poor Mr Yee had to stand between 6 beautiful ladies on each side for some group photos (now, dont be jealous boys). With signboard and certificate of appreciation. Again, the rain stopped while we were inside the house, and started up as we left the premises.. Hmm..
Next stop, Kampung Poturidong, Tamparuli!! Never heard of this place before. It serves no purpose but mainly for attracting visitors I guess. So if you go to the toilet, do you need to do your business upside down too? LOL. The purpose for this well known Rumah Terbalik designed by Alexander Lee is not just only for show or proving the designer as a great designer or even attracting tourists. The main theme for the Rumah Terbalik is about Global Environment. How construction have been and modernization is destroying our green earth. The Rumah Terbalik is just only one of the upside down house structure. There are another 9 more in different nation that speaks out of the same cause. Its unique but with a hidden message inside it. I went to Sabah by looking into this website see what does the website have to offer me.